Cpt. Alexis Polux led the defence of Sotha. The Scythes of the Emperor are a proud Chapter brought low through near complete destruction by Hivefleet Kraken. An event which claimed their once verdant homeworld called Sotha. This world was the administrative center for the Sotharan League (some 86 planets in latest fiction, 2017) and it’s loss and subsequent scattering of the Scythes into a beleagured Chapter Fleet put the region in turmoil for centuries. 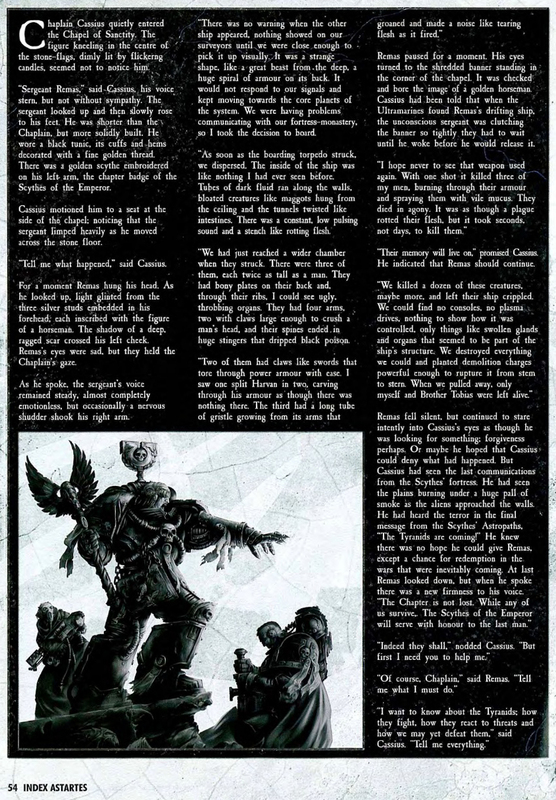 The Scythes of the Emperor’s origins began during the Horus Heresy, when the 199th “Aegida” company of the Ultramarines fought, heavily outnumbered, against the Night Lords in the Battle of Sotha, defeating the traitors as they sought to control the Pharos device, a mysterious xenos artefact buried within Mount Pharos. The device was ‘lighthouse’ to the rebuilding of Roboute’s Imperium Secundus at the time, among many other secret properties it held. Upon Roboute Guilliman’s arrival and defeat of the traitors, he honoured the company with the emblem of two crossed scythes, representing their defence of the farmers of Sotha, citizens of a small but proud population which had suffered greatly under the attack, but did not yeild. 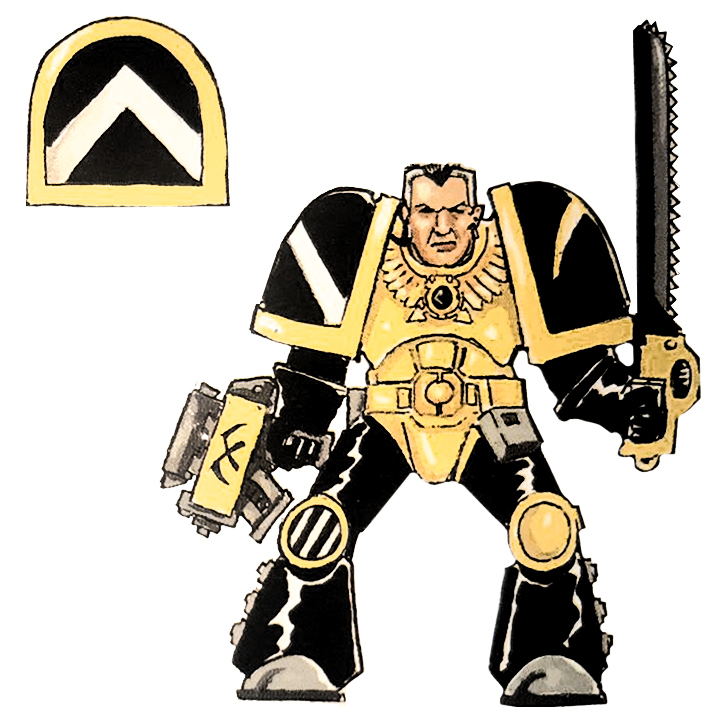 After the Heresy and the Second Founding, the Aegida Company was maintained secretly as a phantom 11th Company under the command of Captain Oberdeii, in defiance of Guilliman’s own Codex Astartes. An act which Roboute Guilliman personally charged Oberdeii to oath, within the exotic tunnels of Mt. Pharos. They continued their vigil over Sotha, Mt.Pharos and the surrounding Sotharan League within the Ultima Segmentum. Taking upon themselves the duty of policing and safeguarding of notable tributary worlds such as Egottha, Beremin, Moloch, Miral, Graia, Veridian, Vespastor, Devlan, Salem, Lamarno, Triplex Phall, Espandor, Radnar and Kimmeria. They performed admirably during notable events such as; The Corinth Crusade (698-705.M41), Damocles Gulf Crusade (745.M41), Xikun Campaign and Verdeworlds Campaign (865.M41). Then came the Tyranids of Hive Fleet Kraken in 992.M41. Their arrival had been foreshadowed in dreams of a young Oberdeii. When, as a neophyte, he had become lost in the tunnels of Mt. Pharos, his mind sensitive to the xenos device within and causing visions of great terror. He kept this knowledge his entire life. During the defence against the Night Lords, the Pharos device was damaged, sending out a powerful beacon. This event was long feared by Oberdeii as having attracted something terrifying and apocalyptic. The Scythes were virtually destroyed during the invasion of Hive Fleet Kraken. Which had already annihilated the Lamenters Chapter in the Devlan system. 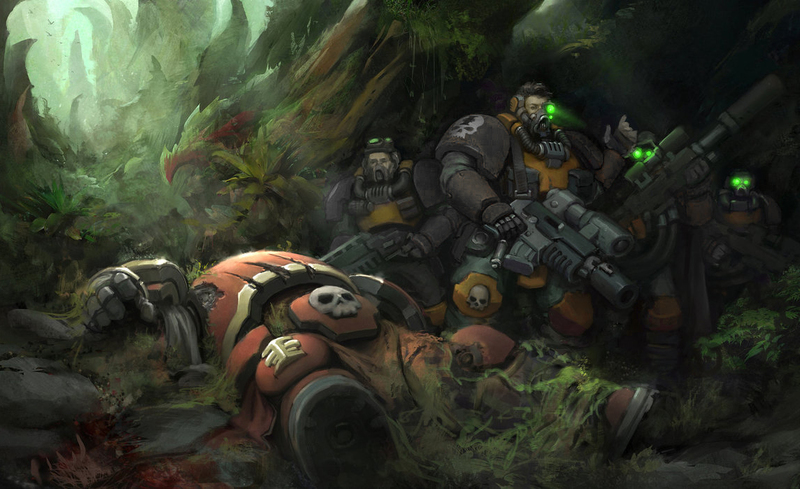 The few surviving Battle-Brothers, less than 100 at the time, swore to spend their lives seeking out and annihilating the remaining Tyranid splinter forces within the Ultima Segmentum and beyond even as they seek new recruits to replenish the Chapter’s shattered ranks. 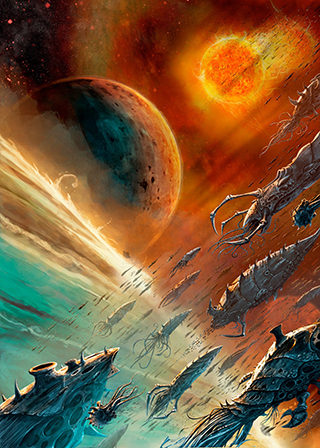 In M41.999, the Scythes emerged fully from the shadow of Hivefleet Kraken, confirming their exsistence yet and began rebuilding. There was much unrest for a time as many wanted to expend themselves fighting Kraken, whilst the leadership intended to recover and rebuild. This schism may have ended when Chapter Master Thrasius sent 40 brothers to the Deathwatch. A deal which may or may not have been struck to obtain much needed geneseed for the Chapter. In this present millenia, post Indomitus Crusade and the returned Roboute Guilliman, the Scythes were reinforced by new Primaris Marines. Arch Magos Cawl and the Ultima Founding have given the Chapter an unlooked for chance to return to full strength. 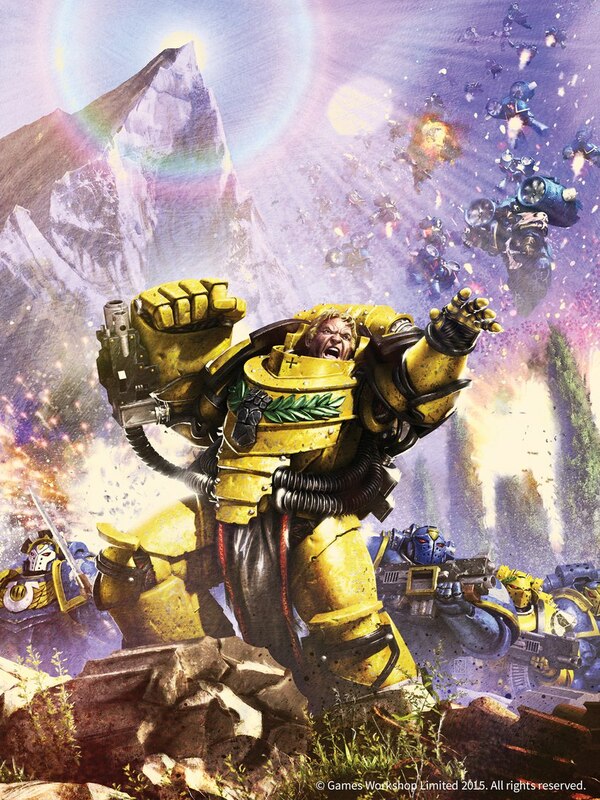 Reinstating their capability to patrol and defend the Sotharan League and Shield Worlds within Ultramar’s fourth tetra, under the direction of Tetrarch Decimus Felix, an Ultramarine Primaris Captain and close confidant of Roboute. Whilst the Chapter maintains a fleet based exsistence about the Battlebarge, Heart of Cronus, Decimus rules the Sotharan league from the newly instated governing world of Vespastor. Rumours abound of Space Marines wearing the insignia of the Scythes still alive inside the Tyranid Hive Ships of Kraken splinter Hive Fleets; “Salvation Teams”; small, autonomous units of Scythes given the task of traversing the battlegrounds of the Eastern Fringe in the wake of Hive Fleet Kraken and running to ground every rumour, every indication of Veteran Scythes still alive somewhere in the wake of the Tyranid assault. 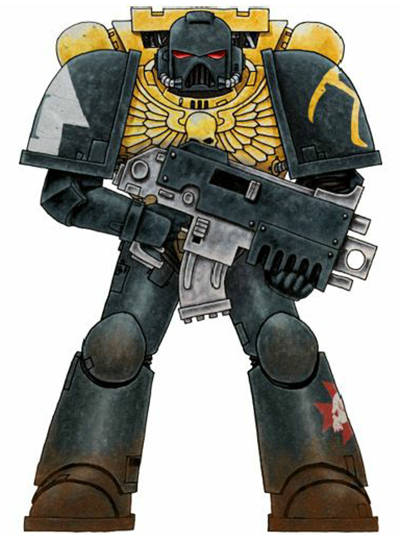 In reality, very few live Astartes are ever found, more often than not the “Salvation Teams” are merely reduced to salvage teams recovering the non-biological artefacts such as Power Armour and Bolters, and not just from the slain Astartes of the Scythes but from many, many other Chapters as well. Still, desperate times call for desperate measures and the Scythes gain invaluable experience in boarding actions against the Tyranids. It is possible that the Scythes of the Emperor now know even more about this foul xenos species and how to defeat them than even the Ultramarines. 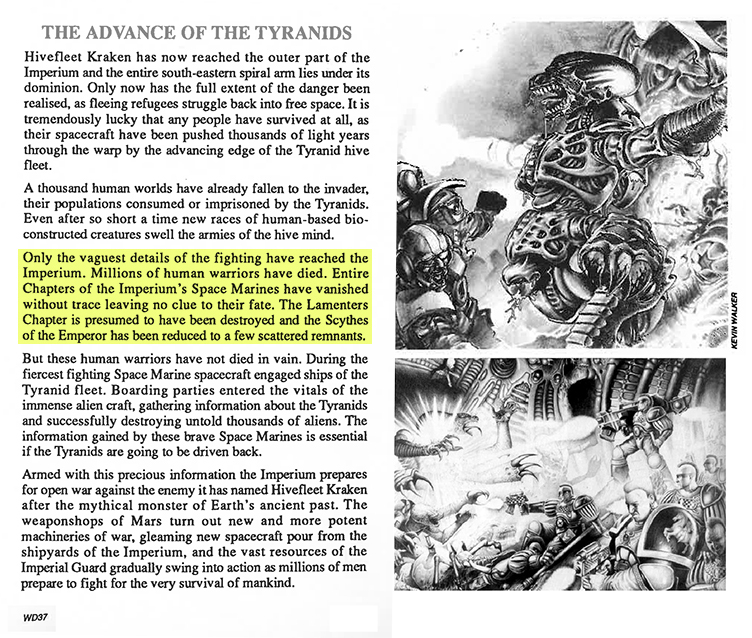 Before 8th edition, Dark Imperium the novel and all the novels and short stories published in recent times, the only mention of the Scythes of the Emperor Chapter was in Tyranid Attack, Advanced Space Crusade & White Dwarf in the 1990’s. Veteran Sergeant Reaper and a Scout from the 1st Squad. Note the Black and White Stripe Kraken Campaign badge. 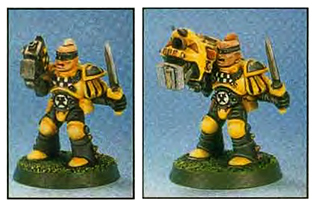 The Scythes of the Emperor Sergeant and Scout colour scheme shown on the inner box of Advanced Space Crusade and pg. 51 White Dwarf 131 November 1990. The Scythes Scout Colours, Advanced Space Crusade. pg.51 WD 132 December 1990. The Scythes of the Emperor, noted in Andy Chamber’s Tyranid Army review (The first official Tyranid list). pg.47 White Dwarf 145. January 1992. The Scythes of the Emperor, featured artwork Tyranid Attack. pg.18 White Dwarf 158, February 1993. The Scythes of the Emperor feature by Andy Chambers, Space Marine and Eldar Scouts article. 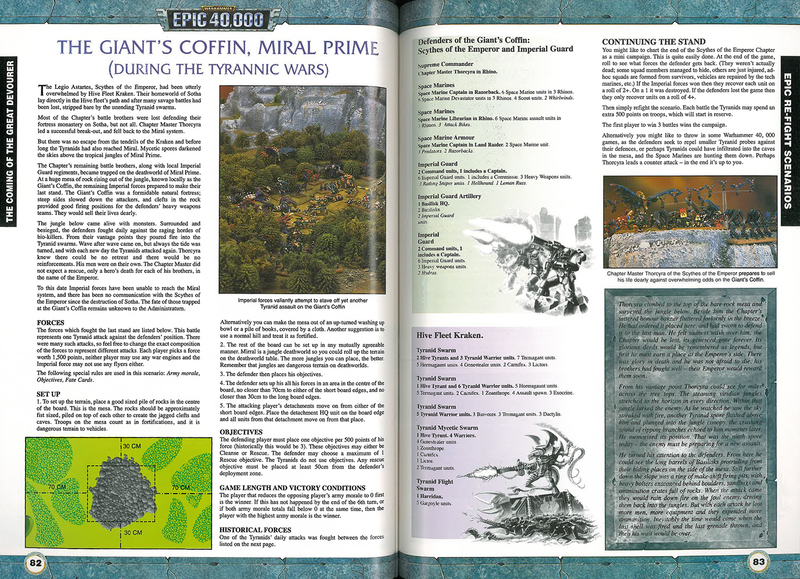 pg14 White Dwarf 159. March 1993. Index Astartes: Purge the Alien. Scythes Sargeant Remas retells his tale to Chaplain Cassius. pg.54 White Dwarf 306 (UK), June, 2005. 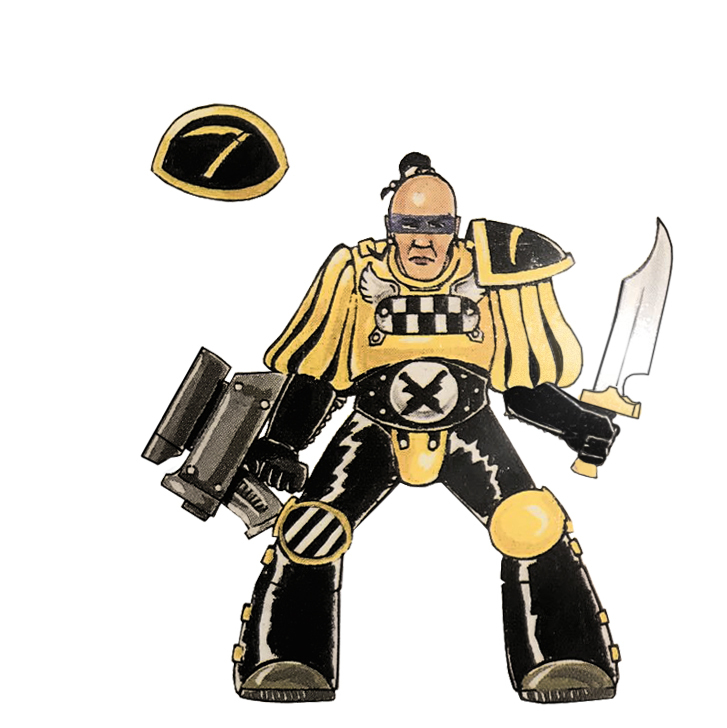 Purge the Alien Notes: As the Ultramarines recovered from the devastating attack of Hivefleet Behemoth, Chaplain Cassius moved to create a specialised force of Tyranid Hunters amongst the Ultramarines. The contraversial force gained new impetus on the attack of Hivefleet Kraken, as a fresh influx of Deathwatch marines from the remaining Scythes, spread further combat techniques amongst other Chapters. The meeting of Sargeant Remus with Chaplain Cassius was instrumental on the Scythes association with the Ultramarines and creating a highly specialised Tyranid response force. This site is amazing Sebastian, I keep coming back to it and finding new interesting tidbits. I chose this chapter because of the links to Pharos when reading the heresy novels, now as I paint up my 4th company scythes, these articles help bring to life what I am painting. I don’t think any other lesser chapter gets this attention, so thankyou. FYI I am working on Company Banner Artwork for every Company – in discussion with LJ Goulding. I am doing both the chest and knee markings. I look forward to those banners! Oh, is there a facebook group or something for scythe players to talk scythe lists and share photos? Oh nice! Look forward to seeing the results :D Please send me photos for the WorldWide Gallery! Banners are underway, I’ve settled on the horses (of the God’s) for each. It has been quite a study in Greek Mythology! As for facebook, no not really. The Scythes have seen explosive interest in the last month. Prior to that there were a dozen players I knew of that occaisionally posted something. At this stage I’ve started to set up the-scythes.com as a nexus – if I spy something, it appears here, instagram and twitter – all in one place.